Bags and rolls of 2013 White Mountain National Forest Quarters debuted today, Jan. 28, 2013. Bags and rolls now on sale contain circulation quality White Mountain quarters from U.S. Mint facilities in Philadelphia, Denver and San Francisco. Depending on the mint of origin, the coins will bear designating mint marks of ‘P’, ‘D’ or ‘S’. Buyers may order single rolls of San Francisco struck quarters; two-roll sets containing coins from Philadelphia and Denver; three-roll sets with coins from all three facilities; or 100-coin bags with strikes from any of the three locations. Detailed pricing of these products are further below. This release coincides with the Federal Reserve Bank system’s initial distribution date. Accordingly, Philadelphia and Denver struck White Mountain quarters — such as those released today by the U.S. Mint — will begin to make their way into the commerce stream through local banking institutions. But finding them locally in pocket change, in good condition, and from both facilities will be a significant challenge in many areas of the country. Local banks cannot order America the Beautiful Quarters by design like they could during the 50 States Quarters® Program. "The Federal Reserve distributes coins to depository institutions to meet transactional demand, without regard to specific design," the Federal Reserve Bank Services website warns. "An order placed on or after the release of a specific design does not guarantee that any quantity of that design will be used to fill the order." In 2013, the U.S. Mint added circulating-quality America the Beautiful Quarters from San Francisco to its product line. These are for collectors and initially available only from the U.S. Mint. Thus, the likelihood of getting them in pocket change is remote. Single rolls of San Francisco struck White Mountain Quarters are available for $18.95. These rolls contain 40 circulation quality coins and are within special Mint wrapping that describes the contents as well as the ‘S’ designation for the minting facility. 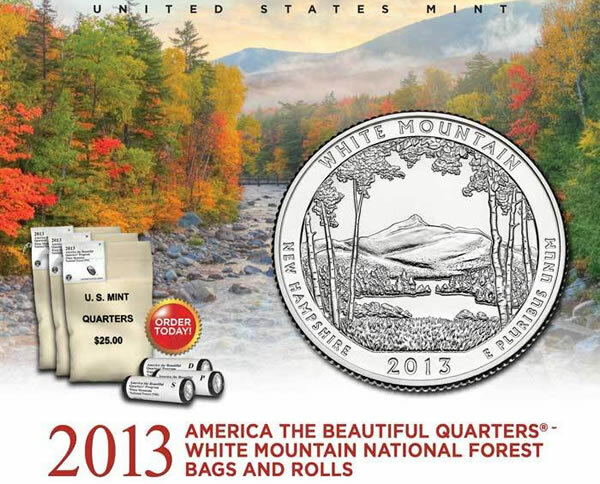 For $32.95, buyers may order White Mountain Quarter Two-Roll Sets. These sets include one roll of coins struck in Philadelphia and one roll struck in Denver. Like the San Francisco roll, imprinted on the wrapper is the contents of the roll and either a ‘P’ or a ‘D’ for the minting facility. A new product this year are America the Beautiful Quarter Three-Rolls Sets. This option has one roll from each of the three minting facilities of Philadelphia, Denver and San Francisco. Pricing of the three-roll set is $46.95. Finally, 100-coin bags of the new White Mountain Quarters are also available. Buyers may choose which facility their coins come from with each bag sold for $34.95. 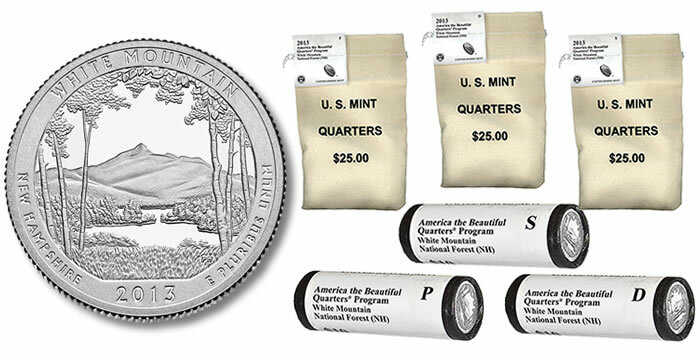 Collectors may order bags and rolls of the White Mountain Quarters via the United States Mint website, found here, or by calling its toll-free number, 1-800-USA-MINT (872-6468). All domestic orders will have an additional $4.95 shipping and handling fee. No household ordering limits are in place on any of these products. Mintage limits have not been published. The obverse of all America the Beautiful Quarters has the same portrait by John Flanagan of the first President of the United States, George Washington. This portrait first appeared on the 1932 circulating quarters. It has been on them, with some minor changes, ever since. Obverse inscriptions surrounding the portrait include UNITED STATES OF AMERICA, LIBERTY, IN GOD WE TRUST, and QUARTER DOLLAR. 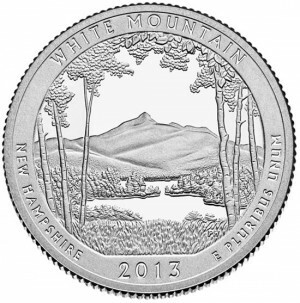 Shown on the reverse of the quarter is the design emblematic of White Mountain National Forest of New Hampshire. This reverse depicts Mt. Chocorua framed by birch trees. The mountain is the easternmost peak of the Sandwich Range. Inscriptions on the reverse include WHITE MOUNTAIN, NEW HAMPSHIRE, 2013, and E PLURIBUS UNUM. United States Mint Sculptor-Engraver Phebe Hemphill created and executed the design. 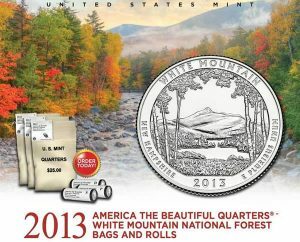 An official release ceremony for the White Mountain National Forest Quarter has not yet been held. Current plans call for the ceremony to take place on Thursday, February 21, 2013, at 10:30 a.m. at the Hanaway Theatre of the Silver Center for the Arts at Plymouth State University in Plymouth, New Hampshire. A coin forum will be held the night before the ceremony from 6:00 to 7:00 p.m. The forum will be located at the White Mountain National Forest Headquarters, 71 White Mountain Drive, Campton, NH. White Mountain Quarters are available in three other numismatic products released by the U.S. Mint earlier this year. They will also appear in several upcoming products. One of the three products is the 2013 America the Beautiful Quarters Silver Proof Set, released on Jan. 8, 2013. This set has all five of this year’s quarters. They are in 90% silver, in proof quality and come from the U.S. Mint facility in San Francisco. Current pricing is $41.95. The 2013 Birth Set debuted on Jan. 15, 2013 has one White Mountain Quarter along with one Kennedy Half Dollar, one Roosevelt Dime, one Jefferson Nickel and one Lincoln Cent. Each coin is struck to proof quality and from the San Francisco Mint. Pricing of the Birth Set is $19.95. The third product released on Jan. 22, 2013 is the 2013 United States Mint America the Beautiful Quarters Proof Set™. Like the quarters silver proof set, it also has proof quality examples of the five 2013-dated quarters but they are in a standard clad composition. The America the Beautiful Quarters Proof Set is $14.95. Keep track of upcoming America the Beautiful coins and products via this site’s news section about quarters.